Want to make your business pinworthy? 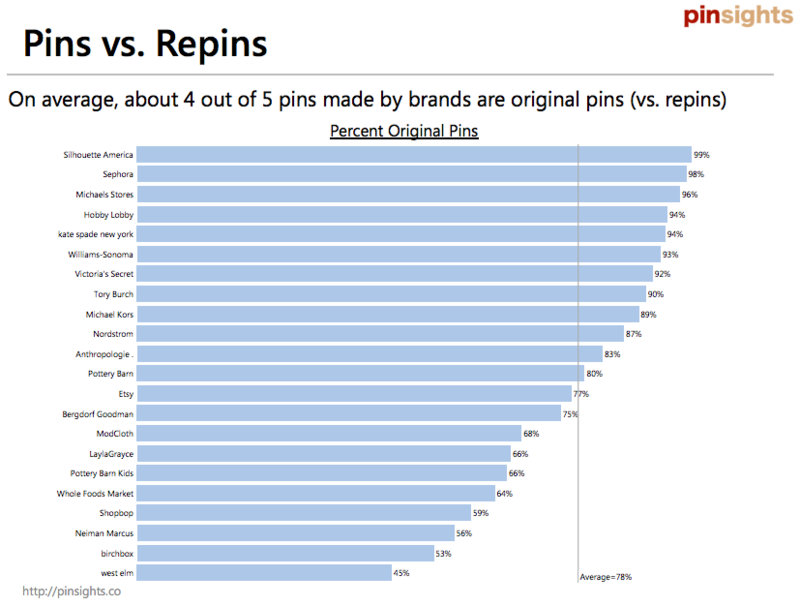 Then take some tips from the proven tactics used by these top Pinterest retailers, based on research by Pinsights in 2Q2012. To help you, here are seven major Pinterest findings and the related actionable marketing tactic. They are based on the analysis of 22 official retailer brand Pinterest accounts. These ecommerce-enabled sites were selected because they had at least 10,000 account followers, had made their first account pin on Pinterest at least 60 days ago, and had made at least 100 pins in the last 60 days. Build your Pinterest base. 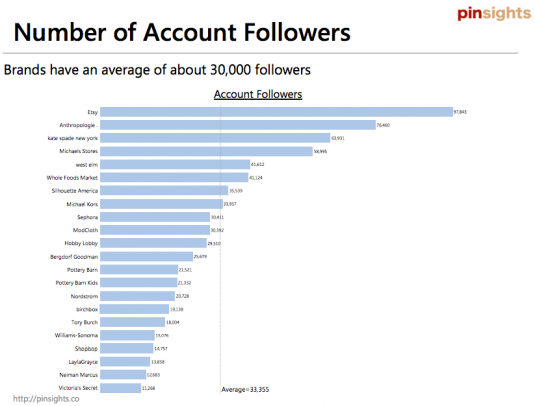 Like other social media platforms, you must develop your following on Pinterest. 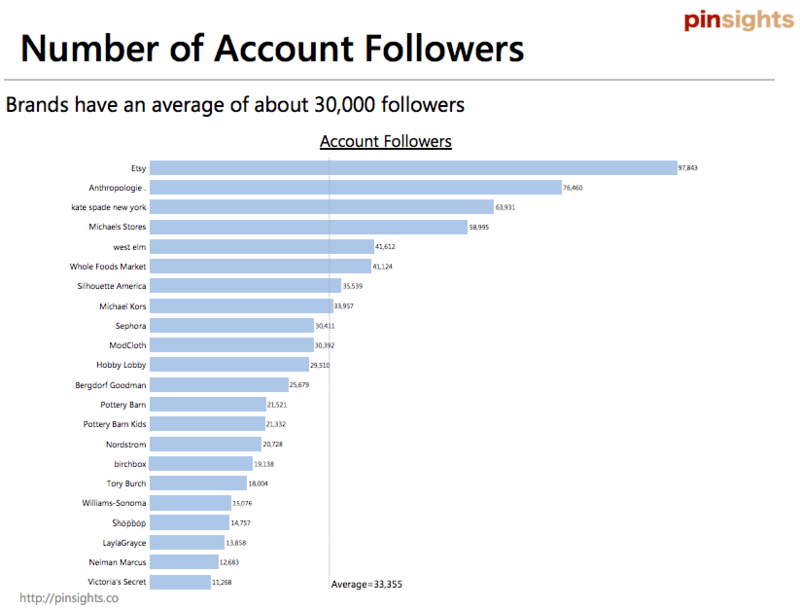 Of the retailers analyzed, the average number of Pinterest followers was 33,355. Victoria’s Secret had a low of 11,268 followers and Etsy had a high of 97,843 followers. Actionable Marketing Tactic: Leverage your owned and earned media to encourage prospects, customers and the public to follow your business on Pinterest. Let people know you’re active on Pinterest and ask them to become part of your community there. Also, allow visitors to pin your pinworthy content by incorporating appropriate social sharing tools. While you’re at it, don’t forget to mind your Pinterest manners. Create and curate pinworthy content. Pinterest is about content, not about communicating. As a result, retailers don’t necessarily follow pinners back like they do on other social media platforms such as Twitter where both parties need to follow each other to engage directly. Actionable Marketing Tactic: Know your Pinterest audience to ensure that you’re able to develop content that they find engaging and interesting. To that end, it helps to develop a social media persona, particularly focused on your target audience’s Pinterest behavior. Focus your efforts. 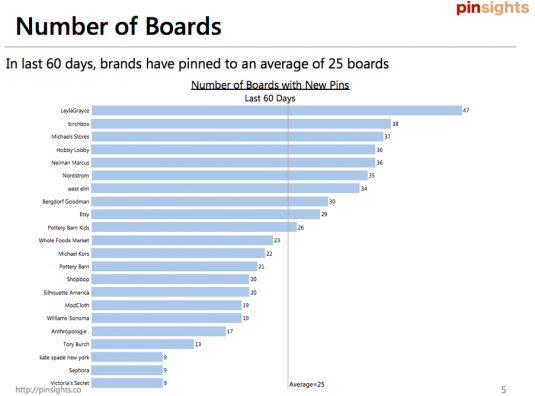 Target each pin board to its micro-niche. Spread content across a variety of different pin boards. 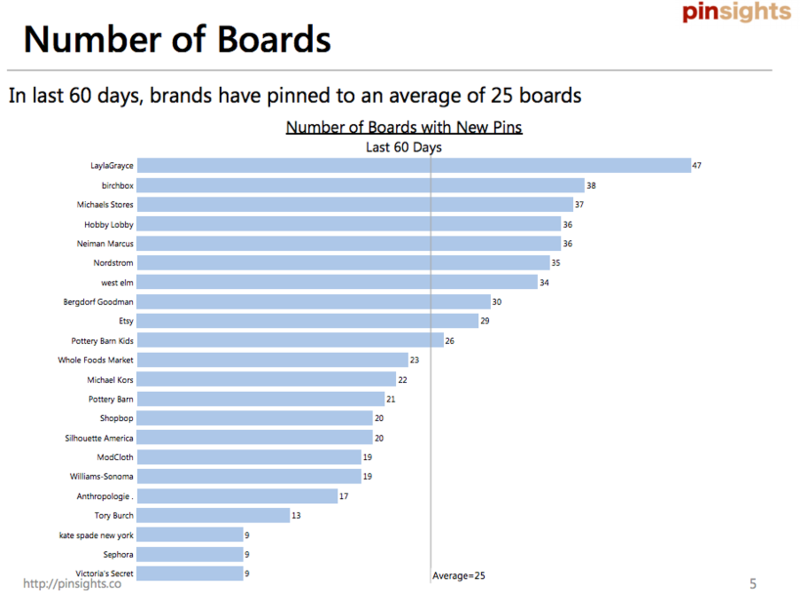 On average, brands pinned to an average of twenty-five boards in the sixty day period, where LaylaGrayce pinned to a high of forty-seven boards and Kate Spade New York, Sephora and Victoria’s Secret pinned to a low of nine boards. Actionable Marketing Tactic: Determine the major categories for content sharing on Pinterest. Use focused topics for each pin board. Layla Grayce has the largest number of boards. They share content their customers find interesting as well as providing another place to distribute their own content such as their newsletters and blog posts. Spotlight content followers find useful. As with other social media platforms, Pinterest isn’t about you; it’s about your followers. Both pins and repins are more viral when they’re from other people’s sites. Just as social media participants don’t want to listen to you yell promotion after promotion at them, they don’t follow you to see pins of your own information. Mix up the content you share on Pinterest. Actionable Marketing Tactic: Keep the ratio of your content to other people’s content low. Use this opportunity to highlight special customers. Note: Layla Grayce’s pin boards of their press and newsletters have lower numbers of repins. Enhance your reputation as the source of original pinworthy images. As with other forms of social media and content marketing, you want to become a go-to authority. On Pinterest, this means curating appropriate content on your pin boards rather than repinning other people’s content. 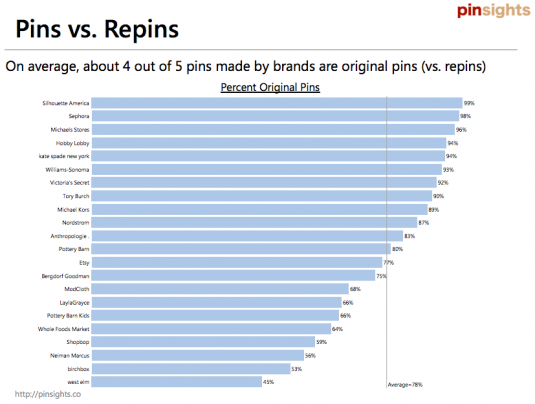 About 80% of top retail pins are original images, not repins. Actionable Marketing Tactic: Invite your customers and other influencers to help curate content on your pin boards. Lure readers onto your Pin boards through the use of non-company content. To help, it’s useful to hook followers by using a variety of different topics. Make sure that about two thirds of the content you pin is from other firms. 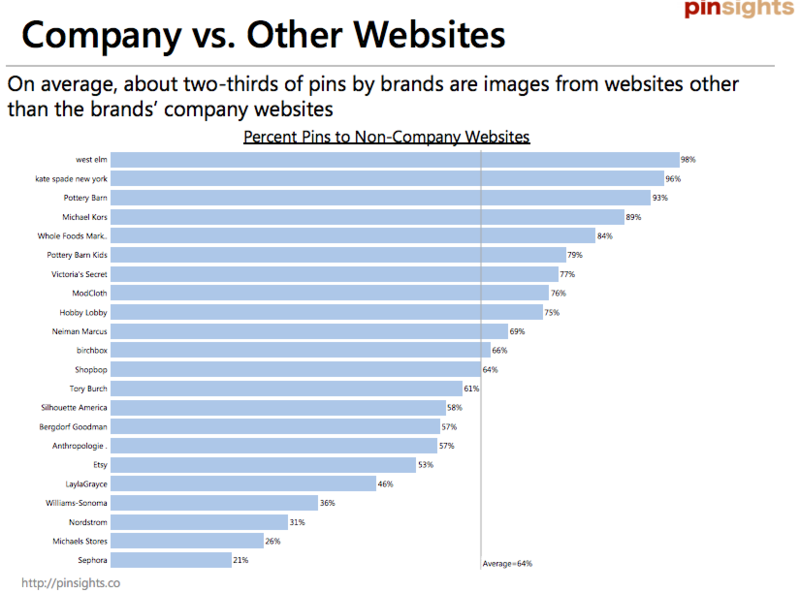 Actionable Marketing Tactic: Pin content from sources other than your firm’s own website. That said, there are useful ways to integrate your own content on a pin board such as PR mentions your firm received. Share pinnable content regularly. 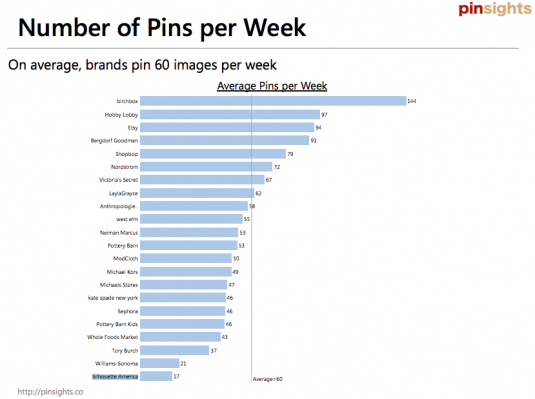 Pinsights found retailers pinned an average of sixty items a week. 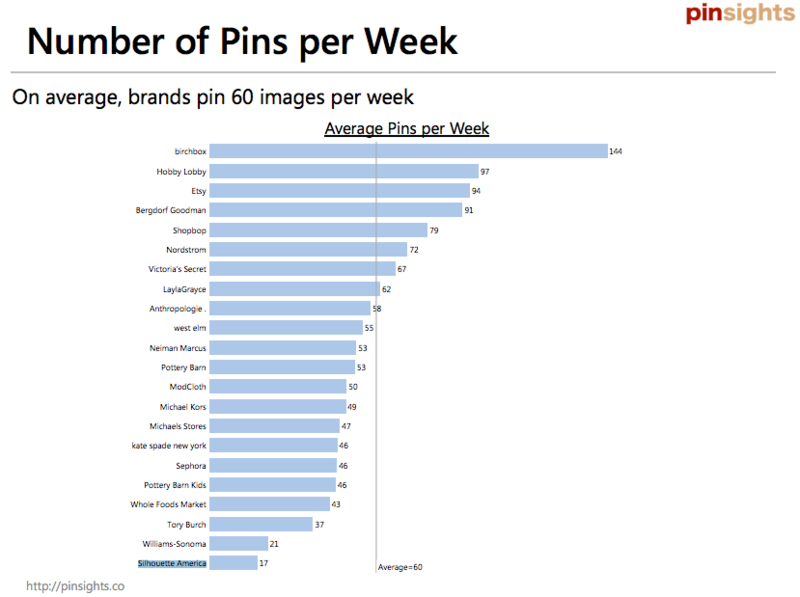 Assuming retailers only pinned on weekdays, they averaged about thirteen images a day. Birchbox had a high of 144 pins per week and Silhouette America had a low of seventeen pins per week on average. Actionable Marketing Tactic: Develop a pinterest content strategy and integrate it into your overall content marketing strategy to limit redundancies. Although Pinterest is a new and growing form of social media content sharing, many of the rules of social media still apply. Pinterest runs on fresh content that’s provided for the good of the community, not to promote your organization. Need further convincing? Here are nineteen reasons to add Pinterest to your social media strategy. What other suggestions would you add to this list to create pinworthy content and why? Tags Actionable Marketing Tip, content marketing, Etsy, Layla Grayce, Pinsights, Pinterest, Research, Victoria’s Secret. Bookmark the permalink. 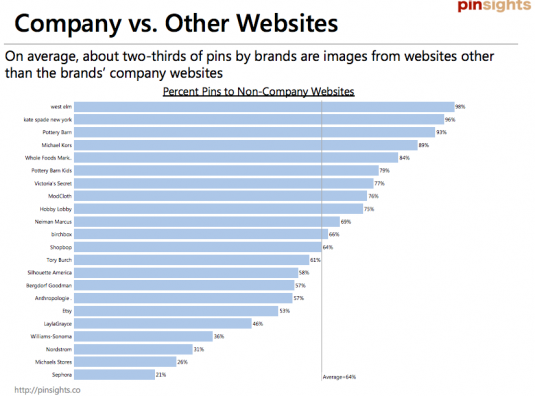 Pinterest has a lot of potential for many businesses, but most especially for retailers. The high number of repins that happen on Pinterest makes it likely that attractive images of desirable products will be shared around a lot. This alone makes it worth putting the time and money into creating the best possible images of your products for your websites and Pinterest boards to encourage other users to collect them.